NOTE: Before each market open we deliver our watch list of hand-selected, high-ranked stocks with specific buying criteria, know as our “Stock WatchList: Morning Update”. Then, throughout the trading day, we issue BreakOut Alerts via email and text message for any stocks from that watch list which trade above their posted TRIGGER PRICE. 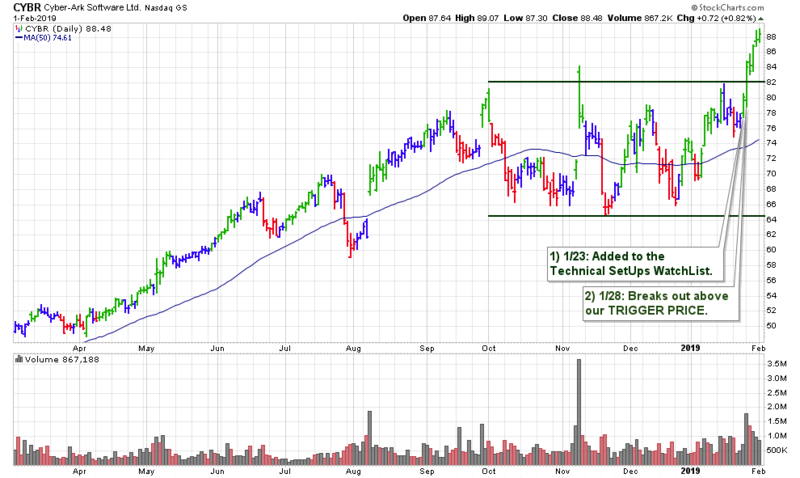 This is still a fledgling breakout as shares have yet to close above their TRIGGER PRICE of $100.10. Also, Friday’s action is a bit of a concern with the stock ending well off of the session highs. The company does have nearly the highest ranks overall and is the #1 leader in a great group. Just need to see more bullish technical action in the form of volume-backed gains to confirm a BUY. On the downside, use the upward trendline (blue-dashed) on the chart below as your guide. Shares have not closed below there since mid-November. 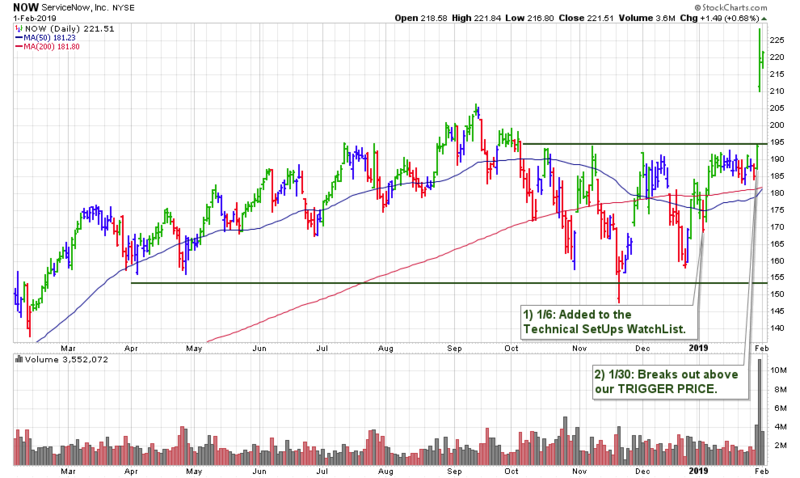 A break below there, then the next area to watch is $90 and the 50-day moving average which would come into play. We had several “Computer” names break out this week as GIB also triggered a BUY signal on Friday. 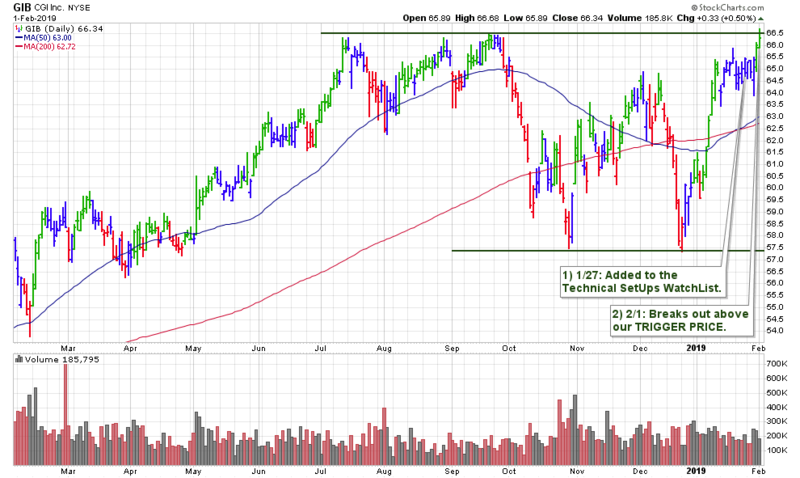 The company did report earnings this week, however, I would not consider this an “earnings breakout”. Three reasons, 1) there was not that much volatility near the announcement, 2) nothing really very actionable in the release, 3) the stock actually broke out 2 days after. Shares did close off of their highs Friday, yet only slightly. Overall ranks are solid and the Computer sector is currently highly ranked as is the stock. Going forward, the first thing to watch out for are any above-average volume declines which would lead to a break back into the base. 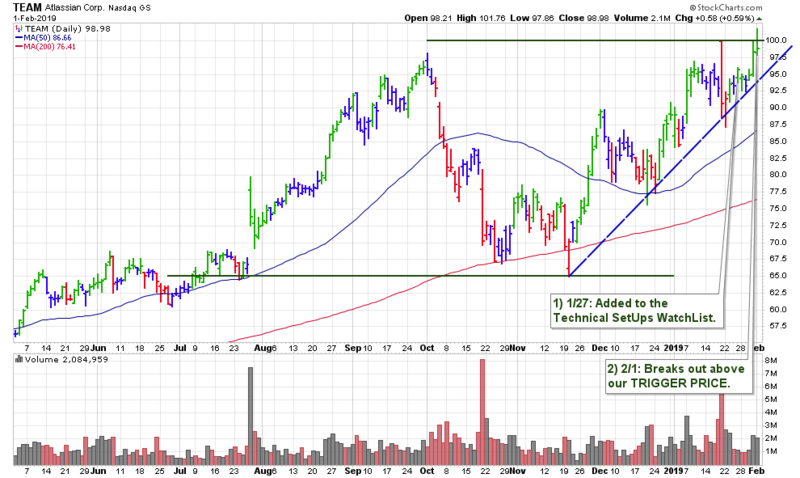 Shares of this set up broke out on Thursday. 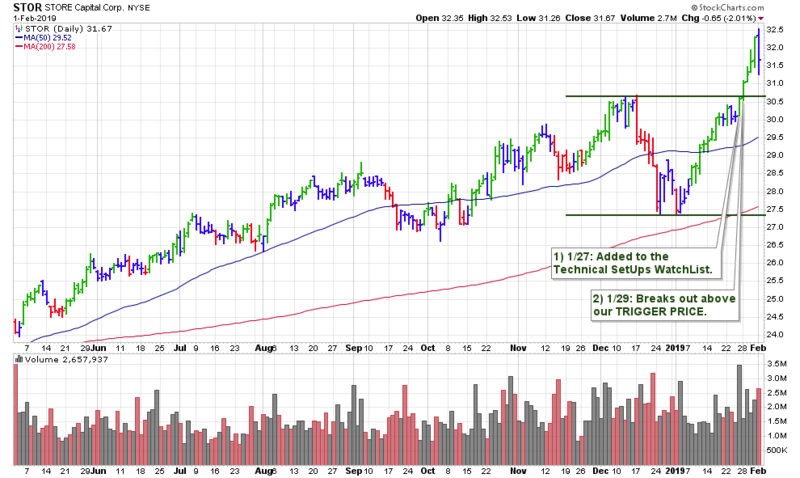 The stock made some slight gains on Friday and closed above the round-$120. What is now of MOST importance for new shareholders is – management will report fourth-quarter and full-year 2018 results on Wednesday, before the market open. A decision has to be made to either SELL or HOLD the selection before Tuesday’s close. Investors are advised to analyze Monday’s and Tuesday’s action very thoroughly. Those who choose to HOLD through earnings should be prepared for some expected volatility. 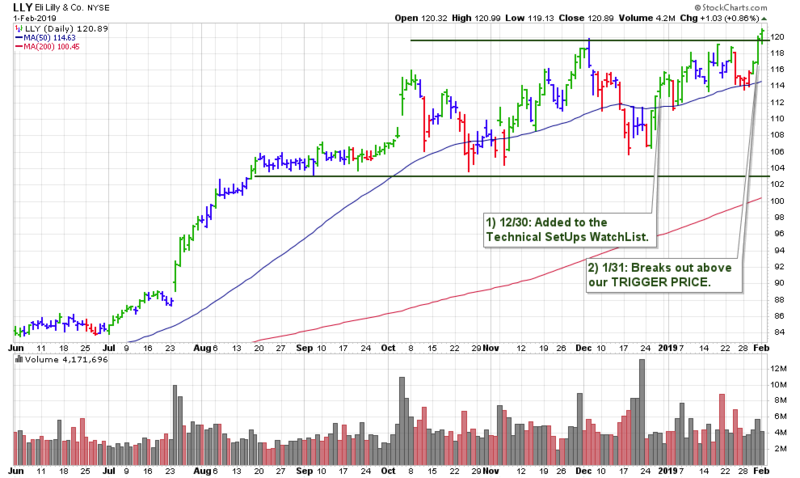 This can be considered an earnings breakout from a portfolio perspective as the stock broke out the day before the company reported. On Wednesday, this stock confirmed a BUY by default as it shares traded above our posted TRIGGER PRICE of $192.26 while the volume was well on pace to meet our TRIGGER VOLUME of 3,485,400 shares. As we say – earnings breakouts can be more rewarding but do also carry more risk as there is expected price volatility near the release of the announcement. Shares gaped open and traded considerably higher. At this point, there is some support to at the $200 area but considering shares are so extended from there, any above average volume declines would be the first concern. I will be watching Monday’s action to see if the stock settles in here or if the volatility continues. I can guess many short-term traders are already out of this one with some good gains. For those who have held – these types of “gap” breakouts on good earnings and guidance news can lead to continued stock gains. All this week shares made some decent gains without any technical concerns as the stock advanced with volume (until Friday). Friday’s action is a serious concern, and this stock should be watched closely for any continued weakness Monday morning. If there is more selling with volume on Monday – that would be an initial SELL signal. This stock broke out for us Monday morning and overall had a great week. Tuesday’s slight pullback was a bit of a concern as it seemed liked shares could start reversing, however, Wednesday’s solid gains quickly negated that action. The stock is very highly-ranked and has solid fundamentals. Number #1 leader in a great group. Hence, it has all the characteristics we look for in a stock to make considerable gains and like TEAM (above), and should be treated as a longer-term holding. WATCH LIST UPDATE: We now have a total of 7 stocks which we will be watching for a traditional breakout to new highs this coming week.